Yesterday: Easing into spring with a printed shirt dress from last year — in the archives here and here — and my trusty denim jacket. And a Doodle who refuses to cooperate with my end-of-the-day iPhone selfies because all he can think about is a car ride (he’s totally staring at the van). Omg, I love your outfit. Definitely need reminder that spring is upon us been still frozen in snow and all. The A-line printed dress with denim works wonder! love the printed shirt dress.. especially how its teamed with the denim jacket..
Love that dress! I have two dogs that look exactly the same. Doodles are the best. I love it…so casual and stylish. Your doggie is adorable! You have done it again ,making people smile ! Reminding us that Spring is almost here. You’re so sweet; thank you Carolina! Super cute! 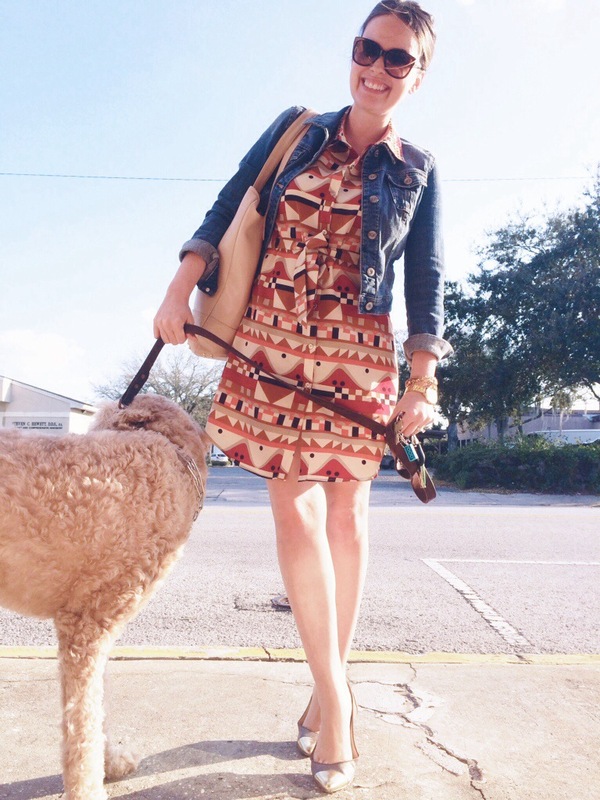 I like the how you styled a southwestern printed dress with a denim jacket. super cute! love that dress! !